Janelle In Real Life: 28 weeks cozy style & some giveaways! 28 weeks cozy style & some giveaways! Hey friends! It's November and that's crazy. The weather is definitely getting chillier around here, requiring a little sweater & boots action (and I can't complain about that). I am in my 28th week of pregnancy now and I'm losing my mind over that. Only 12 weeks left until this kiddo's due date? Definitely not mentally prepared for that. how far along: 28 weeks! Baby is the size of an eggplant. total weight gain: nothing new this time! Still at 20 lbs over my pre-pregnancy weight. 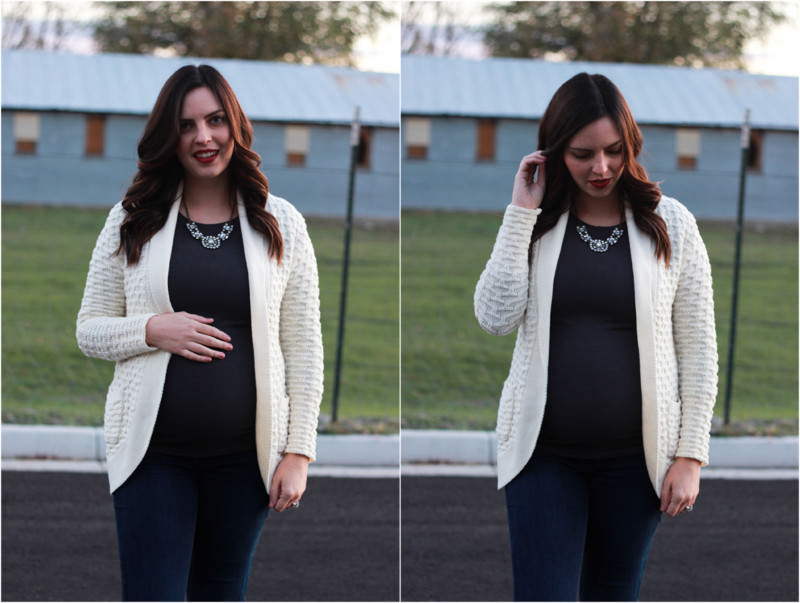 maternity clothes: I have a good mixture of maternity and non maternity going on these days! The only maternity item I'm wearing in these photos are the jeans! stretch marks: It's hard to tell if there are any new ones, but I don't think so! Still using cocoa butter and bio oil. miss anything: just not being quite so large. Washing dishes is kind of hard because my belly pushes me farther away and my arms are stretched kind of far out and my shirt gets totally wet. What a weird thing. movement: lots of that! Carson got to feel some kicks, it was so cute! He likes to put his hands on my belly and say "day-bee!" (baby). food cravings: halloween candy (duh) and other sweet things. anything make you queasy or sick: Not so much! Heartburn used to make me a little sick, but my doctor has me on Prevacid and it's the beeeeeest! No more heartburn! have you started to show yet: definitely showing! And feeling pretty big these days. labor signs: just some braxton hicks contractions every once in a while! belly button in or out: in, but getting so stretched out. wedding rings on or off: still on! Not too much swelling just yet. happy or moody most of the time: feeling pretty happy, but I definitely have those good old mood swings. Bless my husband's heart. looking forward to: becoming a family of 4! And getting the nursery together... just feeling more prepared in general because I do NOT feel that way right now! Pregnancy is crazy and has taken a real toll on my body, especially since I've had a nasty cold lately too. That little toddler of ours brings us all the sicknesses. Little Carson and the husband also had the stomach flu which was awful. Just looking forward to having a healthy family again! I also had the wonderful pleasure of taking my glucose test to check for gestational diabetes yesterday and I'm reeeeeally hoping everything comes back a-ok so I don't have to do that again. Such a waste of sugary intake! And I don't think I can go one single blood draw without getting my vein blown. Gross bruises FTW. In other news, my two year old is learning sooooo many words! I swear it's because he's obsessed with reading. We probably read every single book he owns most days... and some of them get read several times a days. He's memorized parts of some of the books and helps tell the stories now! It's the cutest. Don't forget about some of the giveaways going on right now! 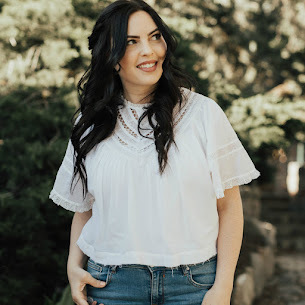 $25 Nordstrom giveaway (instagram only)-- this one ends at 2 p.m. MST today! Aw you are absolutely gorgeous and glowing! I loved reading about where you are in your pregnancy! Get excited, a family of 4 sounds amazing! Really love the light sweater against your dark hair color and shirt. Definitely makes your skin glow! Visiting from the Random Wednesday linkup. aww that she cute you son is excited for the baby. You look beautiul! I think your red lipstick should be your signature. THe cozy off white cardi with the jeans and pretty boots looks fab. You continue to amaze me by doing maternity fashion better than any other blogger I've seen of late. Usually I get a bit bored, but your outfits remain classic and put together and inspirational. You look amazing! I love this sweater on you. It accentuates the baby bump perfectly! Looking absolutely stunning with your baby bump! Lookin good, Janelle!! I'm excited for your little boy (and his big brother). Cute outfit!! Looks comfy and stylish. (sweats are stylish, right? ;) Happy third trimester-YAY!